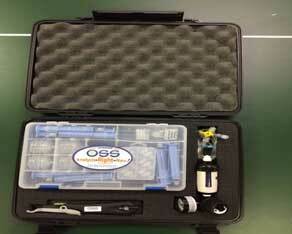 Testing Demonstration Kit | Orono Spectral Solutions, Inc. In an effort to help you convey the technology to target customers, OSS has created a testing demonstration kit that enables you to efficiently and effectively perform the various testing methods at your facility or at the target customer location. ClearShot technology solid state sampling extractors are used to measure oil and grease in a wide range of fluids from water, ammonia, and air. The technology is adaptable to more challenging applications and can be used for quality control, product assurance and customer questions. ClearSampler technology discs enable the safe and rapid gathering of unknown materials for identification. Sample from any surface; rough/smooth, wet/dry, hard/soft, and be certain that the material is in the proper position for the unit to detect. OSS provides additional support with training videos, website content and direct customer communication when requested.